Counted amongst the list of oldest, continuously inhabited locations across the world, Patna has contributed immensely to India’s progress and continued development. Be it through the Bhojpuri film industry, famous politicians or through various other mediums that I’ve left out, the capital of Bihar has left a lasting impression. The same enthusiasm and level of contribution can be witnessed in the realm of Indian startups. It’s time to pore over eight promising entrepreneurial ventures that have sprung up from the land of Patna. We have also covered startups in Vizag, Delhi and other major cities of India. Train journeys, especially lengthy ones can get you hungry while you resist the desire to eat from the in-train caterer. The coverage by media houses and newspapers on the pathetic preparation standards employed for train meals over the years has made commuters apprehensive about consuming these meals. To counter this issue, Manish Chandra came up with the concept of RailRestro. This venture allows train commuters to order from a variety of cuisines both online or offline through the phone on 8102888111. You can order anytime between 7 am and 11 pm, and in case your train is delayed for whatever reason, the guys at RailRestro keep track of the train status to ensure that you receive hot and good quality meals. There’s even an online ‘Food Advisor’ to assist with your queries! A major hurdle for the average Indian is dealing with law and its convoluted system. There’s a need for legal empowerment. And the team at Quaeritur Legal aim to unfetter the common man form the shackles of law related dealings. A discussion form called ‘Before the Court’ is also available for people to engage with the team. And for those curious about the startup’s name, ‘Quaeritur’ is Latin for ‘the question is raised’. Stuck with that clogged drain and your go to plumber is unavailable? Don’t worry, SevaMart is there for rescue. Presently operational in Patna only, SevaMart delivers home maintenance, fitness and business services through professional providers. Customers need to choose a service, schedule an appointment for it and done! Startup India has given recognition to this initiative. Gol Gappa, Puchka, Panipuri… the name differs across Indian states but the taste remains the same! Pizzerias and burger joints are common but what about a place that serves only this delicacy? Wanting to bring an exclusive place catering to the panipuri fan club members, Vinit Kumar, an IGNOU Patna alumnus, started the Puchka Party. At present, the joint offers seven types of golgappas and is going to add more items as it continues to expand. The venture is seeking series A funding and aims to open 100 outlets by 2020. 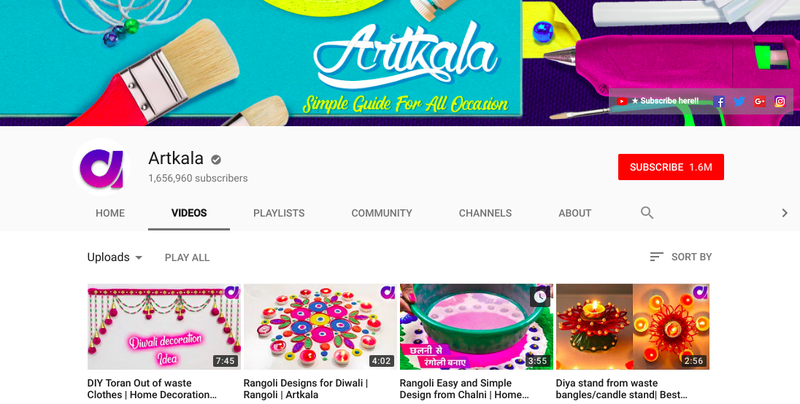 With 1.6 million subscribers and 603 videos as of now, Artkala is the largest do-it-yourself craft making Indian channel on YouTube. Conceived by the trio of Pawan, Puja and Sneha, who also happen to be siblings, Artkala was the product of financial issues coupled with latent craftsmanship waiting to be unleashed. The trio have been felicitated by the Andhra Pradesh government at 2017 ‘Social Media Summit and Awards’. With people across the globe taking note of the channel, Pawan is planning to rise to scale his ingenuity further in the form of a web portal to showcase his sisters’ creations along with DIY kits. Gardening may be a hobby for some but much more than that for others. Keeping up with the ‘going green’ and being eco-friendly, entrepreneur Rahul Kumar has brought about the concept of green gifting. The platform offers a whole lot of items related to gardening and decoration. A variety of plants are up for grab meant for occasions like anniversaries, festivals and birthdays. One can also purchase designer pots. And on top of that, everything is well within budget. There’s a well-known platform for the business community to connect; there are various websites for social connections but did you know about a platform that connects teachers to schools? Esythink bridges the gap between schools and teachers, providing a medium for experienced teachers and those who have just started out in this profession to seek recruitment in schools. Apart from this service, you can buy school related items such as uniforms, books and shoes. A ‘Teachers Hiring Tournament’ service ensures that a qualified teacher gets the right position at the right school. This is our list for successful startups and entrepreneurs in Patna. If you know any other startups in Patna, please let us know in the comment. We will connect with them to feature their story.